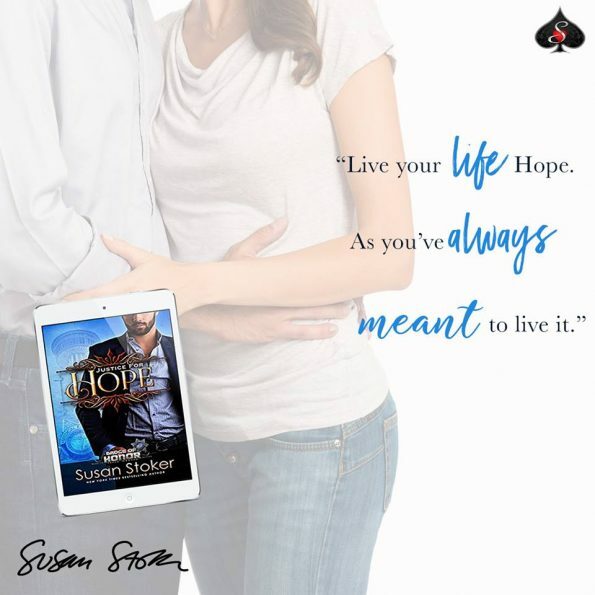 Review – Justice For Hope by Susan Stoker – 5 Sweet, Heart-Warming Stars!!! I was given this book in turn for an honest review. Calder Stonewall was determined to gain the trust of Hope Drayden; now he’d found her, he had no intentions of letting her slip through his fingers. Can Hope let Calder in to protect her, or will her instinct to run, destroy their chance at happiness. Another captivating, brilliant book from Susan Stoker; I seriously love her writing and can never get enough. Another great story and more characters for me to love and adore. I honestly feel, Susan Stokers characters are like family. They take a hold of my heart and never leave; thankfully I have enough love to go around for everyone. I adored both Calder and Hope, both characters were strong, caring, loving and always put the care of others before their own wants, and needs. Calder did everything he could to care for, and support Hope, he would do everything in his power to protect her, and her son. Hope felt like a burden, and it took some convincing to get her to see how deep his feelings for her ran. Justice for Hope is a story that shows, optimism, love, happiness and reminds us to never give up. It also shows the extent some people will go, to destroy a person’s happiness, and that as long as we are open, and honest, they will never come between you and the person you love. Justice for Hope is a wonderfully sweet, heart-warming romance, that will leave your heart bursting with love and your eyes streaming with happy tears.